I cannot believe where the summer has gone. Today is officially the last day of my summer internship with Cornell Cooperative Extension of Cortland County and in less than a week I will be sitting in class at Cornell. I have had the opportunity to do so much this summer in all different areas. Whether it was with dairy cows, corn plants or teaching youth around the county in various different settings, it all flew by so quick! I’ve been busy right up to the very end so I’ll share the last couple of weeks with you! As many people know about, Empire Farm Days took place last week in Seneca Falls. This was only my second time attending, it was something my family never did as I was growing up. It is really awesome to see all of the people attending. Whether they were vendors promoting their specialty in the industry or a business bringing their merchandise, everyone is connected by one thing: agriculture. What some attendees don’t realize, is that Empire Farm Days can greatly benefit the youth involved in agriculture, as well. On Thursday, FFA and 4-H members can compete in different events, one being the Tractor Safety Contest, which I was involved in. In order to be able to, they must have already completed their tractor safety course. 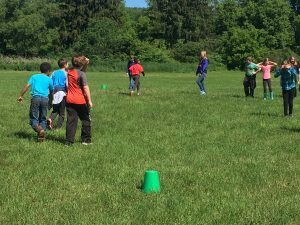 Between FFA and 4-H, there were over 20 students who participated. They take a written test, do a tool identification part, and have to drive two different courses, a two-wheel and a four-wheel driving test. Points are deducted for things like speed, not wearing their seatbelt, hitting barriers and distance from where they are supposed to park it after completion. It is really great to see all of the participants and how knowledgeable some are about the safety and driving skills. This past week, Betsy and I finished at our last tiestall for the tiestall lameness research study that we have been doing and I have been constantly talking about all summer. Next, all of the data will be compiled and she is hoping for results and final conclusions to be available in the fall. I am really curious as to what the findings end up to be and am hoping I get to see them even though I will be deep into my coursework throughout the semester! 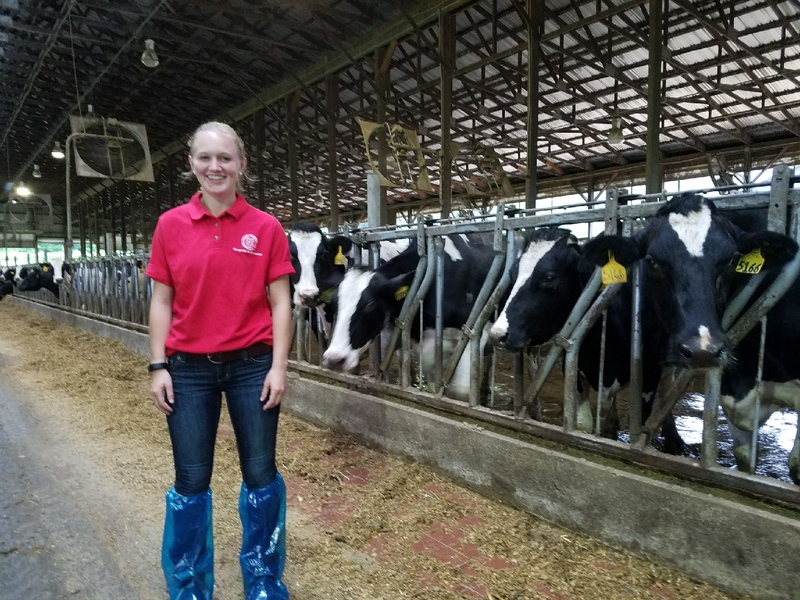 The tiestall study was one of my favorite things that I was involved with this summer, probably because dairy cows are my favorite thing and really my only hobby! In the picture, I am measuring the height of the cow. I measured the height and width of every cow that was involved in the study to see if there was any correlation of lameness and size. It will be interesting to find out if there was or not! Another neat thing that the South Central Dairy and Field Crops team does is send out a couple of digest newsletters throughout the summer to agriculturists in the areas that they cover. The digest includes articles written by members of the team, as well as other scholarly articles about whatever is a hot topic. 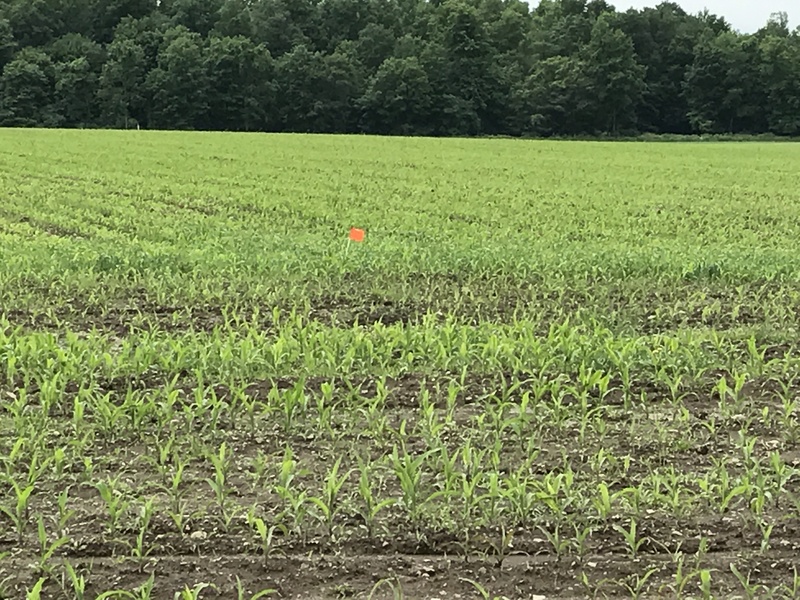 This particular digest includes articles about different things like heat stress in dairy cows, corn harvest because the weather has been so crazy, as well as common pests found in field crops throughout the region this summer. I have attached the link below for those interested in reading the digest. Check out the article I got to write about the robot farm tour! As my summer internship comes to an end, I am very thankful that I was able to intern at the Cooperative Extension office in Cortland with the 4-H department and the South Central Dairy and Field Crops team. It allowed me the diversity I was looking for, while still being connected to agriculture in all of the different departments. I learned a lot and had a lot of fun while doing so. This is a summer I will definitely not forget! The last few weeks I feel like I have been here, there and everywhere, but I have enjoyed myself at each stop along the way! Usually after the county fair is over and done with, summer starts to slow down a little, but not in my case. I have the opportunity to be involved with a lot of different things this summer with Cooperative Extension and I am having a blast at each thing! After breaking for lunch and traveling to the next site, we had a similar itinerary at the second farm on the tour. After learning and touring the veteran operation, who has been using robots for about seven years, it was time to pack up and call it a day. I think it was really helpful to have a workshop/tour on just exactly how technology is being incorporated in the dairy industry more and more and showing other producers what the future may look like, especially for smaller-scaled farms. Being the first event that I have really ever had to solely coordinate, I would say it was a pretty successful day! 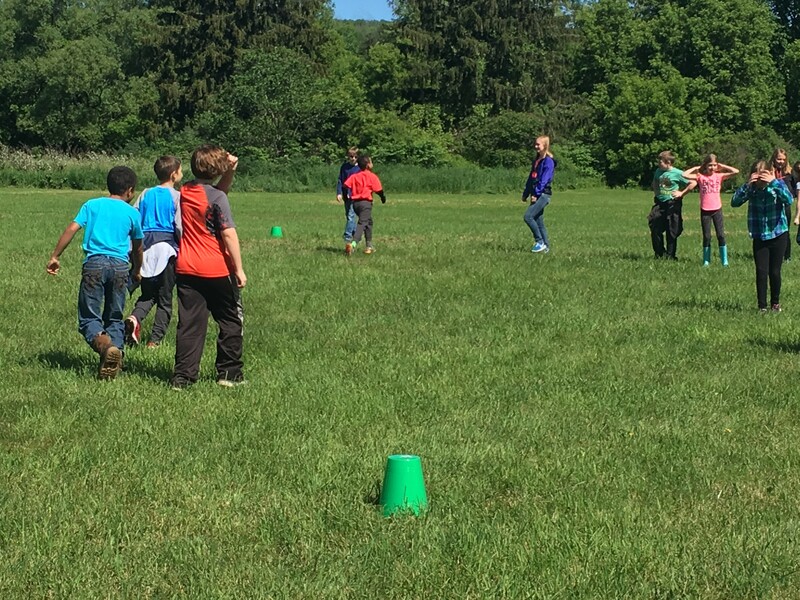 Throughout the summer, there are many local towns who have summer recreation programs for the kids in the neighborhood to attend. 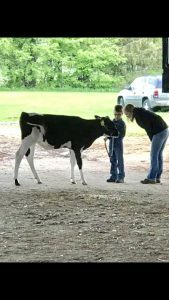 Though it can be difficult to schedule, 4H in Cortland County always tries to make a few stops at a couple different ones in the area. A couple of weeks ago, I went to one of the local recreations and did an activity on soil. It was one of the few days where the sun was shining, so the kids were really excited to be outside. I taught them about the different soil particles and layers by having soil for them to put into a plastic bottle and adding water. After time goes by, the particles settle by size and the distinct layers (sand, silt and clay) are apparent. They got to take their experiments home with them, too, so I think they were pretty happy about that, as well. At the beginning of the week, Betsy, the area dairy specialist, and I put data loggers on at our fourth tiestall for the ongoing study. That leaves just one more. We have ran into a couple of problems throughout our study, but it is our first time with this type of research, so I guess you learn as you go. We seem to lose about one logger per farm that we do for various of reasons. If they fall off when the cows go out to pasture, there is a lot of ground covered, so they are not always retrieved. Also, if they fall into the gutter and then it is emptied into the manure spreader, well we just assume that it probably is not in one piece anymore! We had a couple of extra to start off, so that is a positive! I enjoy going to each of the farms to do this study because you find different things at each farm, even if they are all tiestalls. One of the most interesting findings to me is how the stall measurements differ, not only just from barn to barn, but sometimes even on the same farm! For example, you can tell which barns were built when ind ustry standards were different and where improvements have been made on any given farm. It is almost like using a lens to look back on history. We have one more farm to do and it will be neat to see what the concluding results are at the end. Yesterday, I had another opportunity to do a youth program. This program was with migrant youth from the area, whose parents are involved with the agriculture industry one way or another. This particular part of the program is a three-day event for the youth to get out and about and exposed to different things that they may not get the opportunity to otherwise. We were at a site that had a pond and trees and such. I taught them a similar program as before about soil, but incorporated the water and aqua life into the lesson. We also learned about the different plants and insects. The youth really did learn a lot about their surroundings and I would definitely say it was a productive day. Whether I was working with kids or cows, the last couple of weeks have been fun and productive all at the same time. I cannot believe that the semester starts in just over two weeks and how fast this summer has flown by! I remember when I was younger, I could never grasp how fast time went by at my county fair. Last week, I had the same feeling. 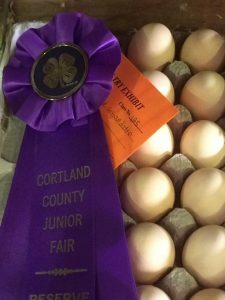 The Cortland County Junior Fair kicked off on July 4th and ran through July 8th. 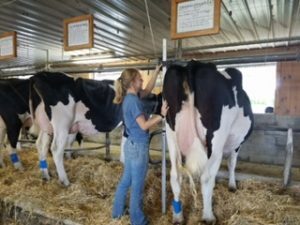 The fair week was jammed pack full of activities like animal shows, an adorabl animal costume contest, a dairy birthing center and special contests like a Jr. Iron Chef, Dairy Challenge and Judging and Tool Identification only to touch the surface. The 4-Hbuilding was full of nonperishable exhibits from awesome crafts and baked goods, to my favorite, an amazing picnic table built by one of the 4-H members! I spent a majority of my time with the animals, one way or another. Whether it was checking registration papers, doing a daily herdsmanship check, helping with the annual 4-H market sale or helping out at the animal show of the day, I definitely was busy! Seeing how the fair runs from the inside-out was an eye-opening experience; no longer an exhibitor, but now an individual making sure the fair runs as smoothly as possible. This gave me a different lens to look through and a new perspective that taught me much respect to those who work all year to make one week as successful as possible. The exhibitors all did a great job and overall the fair went very smoothly and planning for next year has already begun! The biggest news of all though, is that about 19 eggs hatched! I incubated them for about 21 days in my spare bedroom and was so nervous that I had messed them up and that there were not going to be any eggs hatching at fair for the kids to see! I must’ve done either something right, or only a few things wrong though, because we had chicks! Of course, I don’t have pictures to prove it though, so you’ll just have to take my word for it! The Monday mo rning after fair, Betsy, the dairy specialist, and I had another tiestall barn to go to for the project we have been doing. We have to go and put the data loggers on while the cows are in the barn, which is usually during milking time. We had to be there by 6 AM and finish putting them on before it was time for them to go outside after milking. We have done three farms so far, and have two more to do during this round of the study. 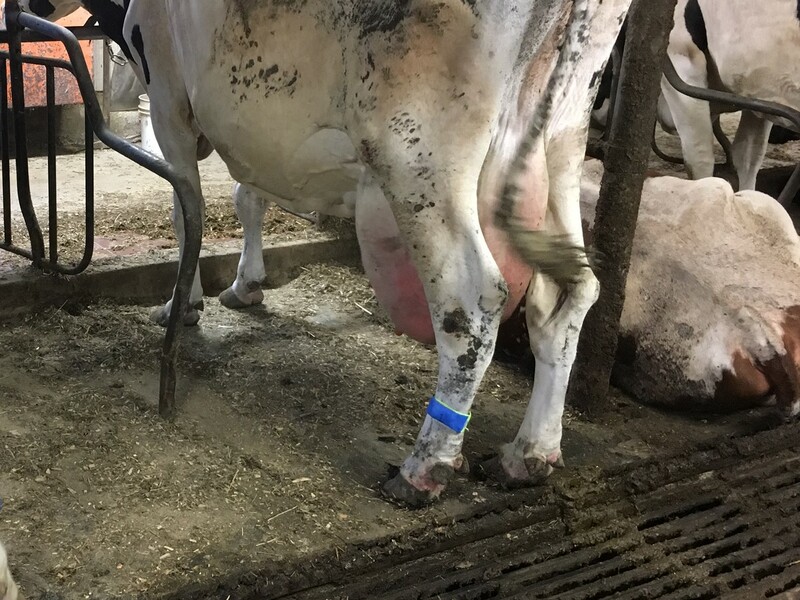 Again, we will be tracking lameness through lying time, standing time and just overall how the cow is able to get up and down and move around (locomotion). Lastly, the summer tours put on by the South Central Dairy and Field Crops Team are beginning. Last night, we kicked off our first Twilight meeting, which we held at a local farm during the evening and covere d cow comfort. These workshops/tours are open to producers/agriculture business people in the surrounding counties that the SCDFC team cover. A couple different speakers came in last night to cover topics such as animal handling, barns and facilities and the on-site veterinarian and partner talked about different cow comfort topics like the stalls and bedding and such. After going through the presentations, we all took a tour of the different barns. It was neat to see how each barn actually does differ, depending on when it was built and what the industry wants were at the time of building. We got really good feedback from the attendees and I’m looking forward to the robot farm tour, which is coming up next week. I cannot believe that today is already the last day of June! These last couple weeks have been quite busy with some awesome hands-on research with the tiestall lameness project and a lot of prep work for upcoming summer events. I usually try to make sure I have plenty of pictures for my blog, so I apologize that this post will be a little slim when it comes to photos. I said in my earlier blog posts to stay tuned about the tiestall lameness study that I was helping Betsy Hicks with, and the wait is over! We are in full swing and have already put the data loggers on at two different farms. There are five farms total in this round that we are doing. We put the data loggers on while the cows are in the barn so that it is easier for both us and the cows. The data loggers are really small devices. I would describe it as like a watch battery in the way it looks, but is a lot bigger, about the size of a quarter or half-dollar coin. We wrap them each in a high-visibility leg band and a lot of vet wrap so that they hopefully don’t fall off. The picture shows what one of the loggers look like once they are on. We had already sat down and met with the producers to fill out paperwork, so it was now time to start the actually measuring part of the study. The goal of the study is to correlate lying time with lameness on tiestall farms and then present feedback to each farm on ways to improve. When we get to each farm, forty cows are chosen at random to participate. I also take stall measurements throughout the barn and record information about that, while Betsy goes down the line and does some different scoring, like hygiene and body condition. We also look at each animal’s hocks and necks for any injury or swelling from getting up and down in the stalls. I also conduct height and weight measurements on each cow participating. Once all the data loggers are on, they also are scored on locomotion. Each cow is let out of the barn one by one so that they can receive a locomotion score, which is based on how they walk and if a lot of effort is needed or not. There is a reader that stays in the barn for the duration of that farm’s participation that stores all the data for each farm. The data loggers stay on for five days at each farm and then the data is downloaded onto the computer before bei ng reset for the next farm. We have another farm coming up in a couple weeks. When I’m not busy spending my time in a tiestall barn, I have been doing a lot of prep work for our upcoming summer farm tours and the county fair, which starts on Tuesday, July 4th! I cannot believe that the fair is already here. The South Central Dairy and Field Crops Team puts on quite a few different tours and pasture walks throughout the summer, so I have been working on finalizing details for the tour that I am putting on, as well as making a summer flyer to go out to the area’s producers to provide information to them. 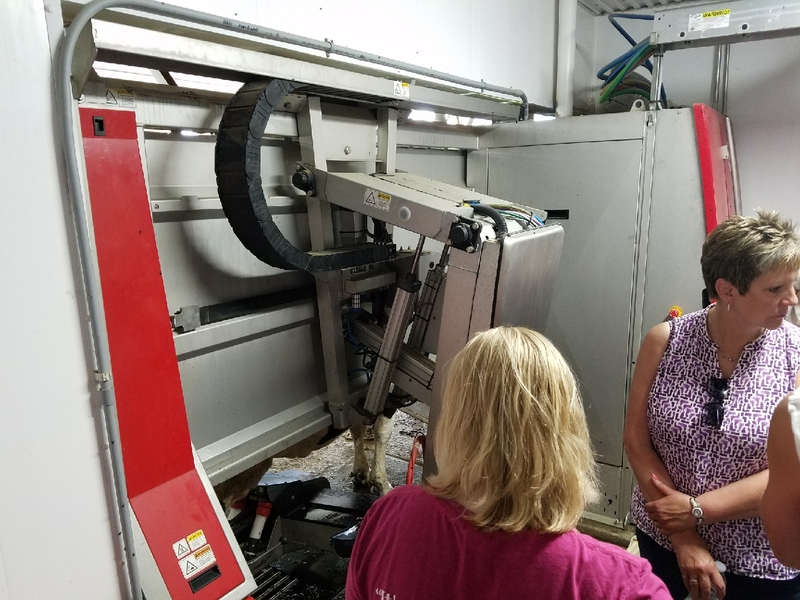 The tour that I have been coordinating is a Robot Farm Tour, which includes visiting two different farms during the day and hearing about the ins and outs of each facility and how this technology is beneficial to their operation. It’ll be neat to see the crowd that will hopefully come and check it out. Today is the last day for us to really set up the fairgrounds and get everything ready to go before people start to show up. 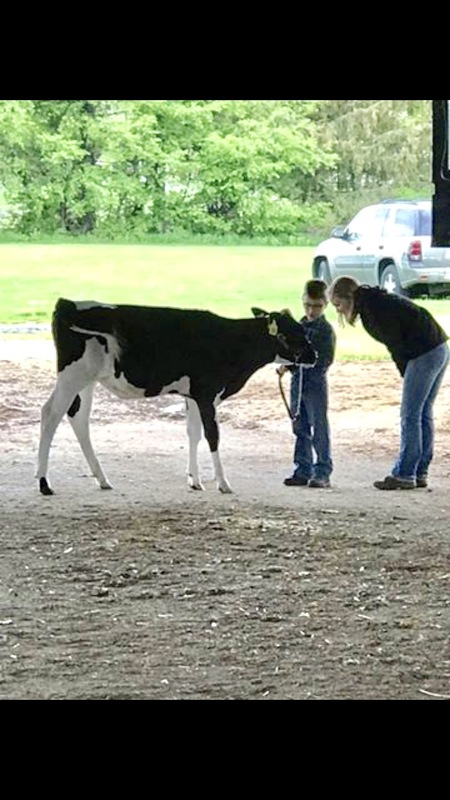 Putting on the fair is definitely a huge team effort and the 4-H department here in Cortland County puts in a tremendous amount of effort and time to make sure it is a memorable experience for the children. 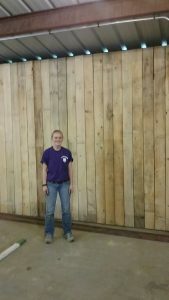 This week I spent some time at the fairgrounds putting up name cards throughout the dairy barn so the kids could start setting up their bedding and display for their animals beforehand, as well as getting all of the fire extinguishers in place. In the office, I’ve been putting together the Dairy Challenge contest, as well as some other odds and ends. The little things really add up! 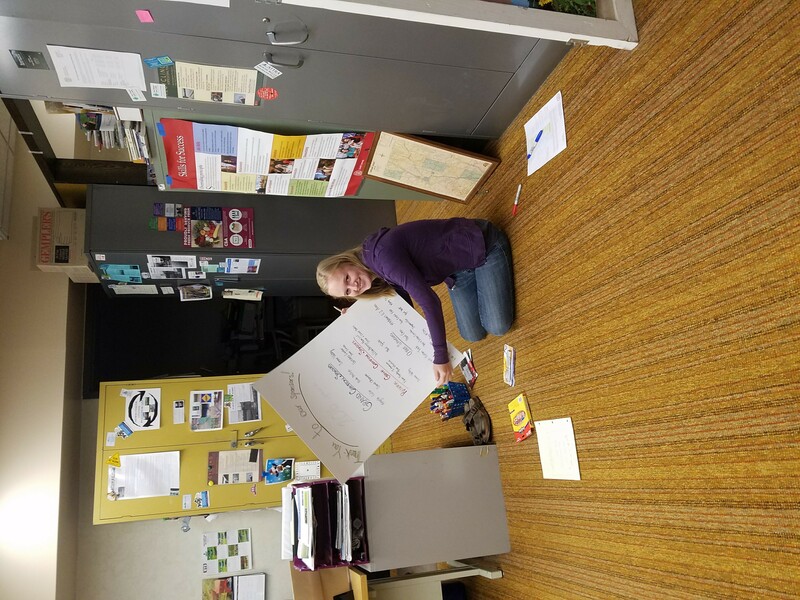 In the picture, I am finishing the poster I made for the 4-H market sale, thanking our sponsors for participating in the auction and buying animals. We also had a clean-up/set-up night, where 4-Hers and their parents come down to help clean up the buildings and set up things like rabbit cages and animal pens.This morning I went and dropped off my eggs at the fairgrounds that I have been incubating since I will be at the fairgrounds this weekend for a different cow show and they are only a few days from HOPEFULLY hatching! What an experience this egg business has been! 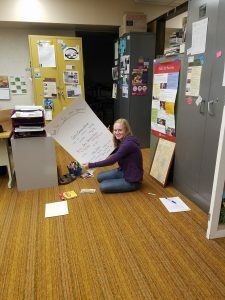 After I finish this blog, I will head back down to the fairgrounds to drop off a lot of things that we have piled up in the office and set-up the 4-H building so that exhibits the members enter will have a place to go after being judged. Even though the last couple days and the days to come may be hectic and a little stressful, it’ll all be worth it and I could not be more excited! I spent a lot of time the last couple of weeks out of the office and out in the field. With finally some nice weather, I was so glad to be able to spend many of my days outdoors! One of the main events that we had is called Agstravaganza. Agstravaganza is a two-day event held at the county fairgroun ds. About a dozen fourth grade classes from the area schools come each day to learn about all of the different avenues of agriculture. 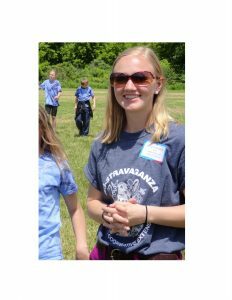 I ran a station ab out 4-H and why agriculture is important to us, as well as played a few agriculture-based games. It is a really great way for students to learn about what agriculture is and everything that is included in it. Then, the following week the local fifth grade classes had a field trip again put on by Cooperative Extension at a local dairy farm. The McMahon’s own E-Z Acres, where they milk around 700 Holstein cows. Again, this two-day event provides the ins and outs of a dairy farm with the classes visiting around ten stations throughout the farm, ranging from hoof trimming to equipment and soil health. I ran the calf station, where the students learned about calf housing, nutrition and the life of a calf on the farm. It was a really fun experience sharing knowledge that I am passionate about and spreading the importance of dairy and agriculture to the students. This past week, I spent most of my afternoons out in corn fields getting a sunburn (I forgot sunscreen!). Janice, the fields crop specialist, has three different cornfields that we are doing research on this summer. Each field has fifteen plots, with eac h plot having either 36 or 24 rows in each, depending on the size of the field. Different fungicides and amounts will be sprayed on the different plots; the first field being sprayed today. It was my job this week to visit all of the fields and measure plant populations on all of the plots in each field. While it might seem like a simple task, it was quite time consuming. I had to do three populations in each plot and there were fifteen plots per field. That’s a lot of measuring! The different plots are divided out by the flags, as you can see in the picture. The best, yet most intimidating thing in the last couple weeks are the chicken eggs that are currently in my spare bedroom. The eggs themselves are not at all intimidating, who doesn’t love little chicken eggs! What is intimidating is that I’m in charge of hatching them! Each year for the county fair we hatch eggs for the 4-H building so that the kids can see them throughout fair week. It takes 21 days for them to hatch, so for the days that are left, I’m in charge. That’s a lot of pressure, I hope I don’ t mess it up somehow! Until next time, stay tuned for my next blog and hopefully the eggs will still be in tact! Let the New Adventures Begin! This summer I am spending my time in Cortland County, working in the Cornell Cooperative Extension Office. I just officially finished my first week and it is off to a great start! The neat thing is that I am not only working in one avenue of extension, but many. My sole focus for the summer is education, both youth and adult. A lot of my time here will be with the 4-H educator, Rebecca Ireland-Perry, where I am working on different lesson plans and workshops with local recreation programs and the county’s camp, Camp Owahta, where I will be doing livestock lesson plans with the kids each week. Also, I will be heavily involved with the county fair, which is less than a month away! That’s not all, though! The South Central Dairy and Field Crops Team is also based out of the same office. I will also be working with Betsy Hicks, the area dairy specialist and Janice Degni, the team leader and field crop specialist. The big summer project with Betsy is a tiestall lameness study, so stay tuned throughout the weeks! I have already gotten the opportunity to get my hands-on experience in many different areas of agricult ure. Memorial day weekend, I was able to spend at the county fairgrounds. 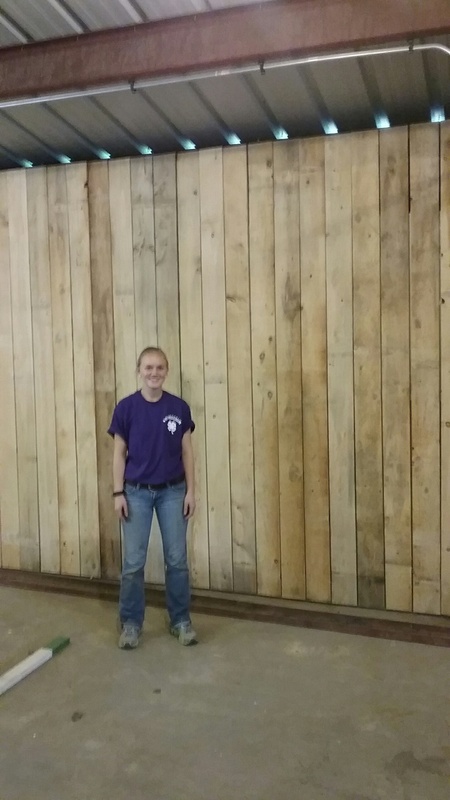 The walls in the 4-H building at the fairgrounds are getting a “facelift” so I spent most of Saturday working on putting up the new walls and basic carpentry. I had little to no experience with tools, just the basics like a hammer and drill, so this was an awesome opportunity to learn. I want to teach agriculture education, so this was a great lesson in a different part of agriculture and vocational education. 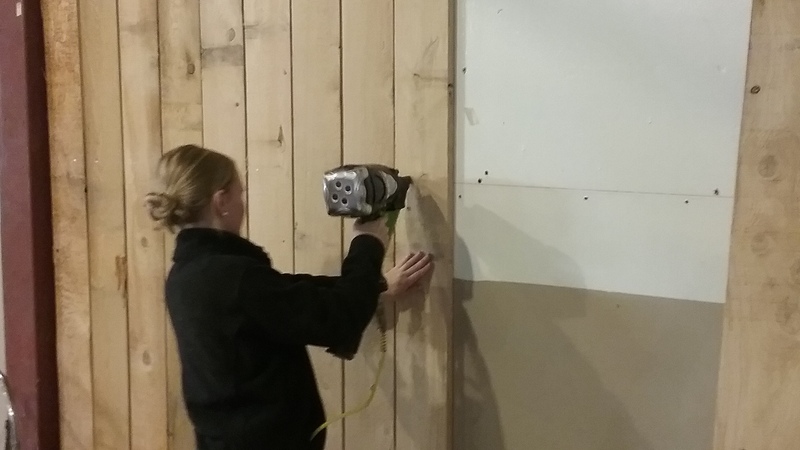 My favorite part was using the air nailer, as you can see in the picture! Also during that weekend, the state goat show was going on at the fairgrounds, so the 4-H Teen Council group had the food booth open, so on Sunday I helped out with that. A few weekends prior to the end of the semester, I was able to sort of start my internship a little early, with the annual Dairy Rodeo, and what a fitting name this is to the event. It is an all-day event where the 4-H kids are given a day to train, clip and show their animal. In the morning, a couple areas farms bring thirty or so calves and each kid gets a calf. I then did a showmanship demonstration for the members and another individual did a clipping demo to show the kids the proper way to clip their animal. Then then have the rest of the afternoon to wash, clip and train their animal to walk. 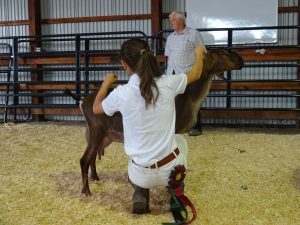 I spent the day in the show ring helping the kids get their ani mals to walk and gave them pointers on their showmanship techniques. Then, at around 5:30 or so, the “mock show” began. The classes for the show were divided up based on age and I was the official judge. I placed them beginning with a first place winner and then went through the group and said what they did well and what to improve on given the circumstances. All of the 4-H members did a great job given the circumstances; there are a lot of calves who only want to run and some that don’t want to move, so it is a long day for both the kids and the calves, but definitely a learning experience for both! 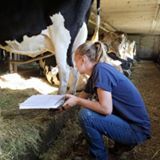 Like I mentioned earlier, with Betsy Hicks, the area dairy specialist, we are working on a tiestall lameness study this summer, where we will be measuring lameness, the size of stalls and overall body condition scores, along with other specific parameters. This past week we went out and met with a farmer who will be participating in the study and sat down with her to find out specific information about her barn and farm. The team is also doing a few different farm tours this summer, one of them being a heifer barn facility tour. On Friday of this past week, we went out and visited a few farms to invite them to host one of the tours of their facilities. I have a feeling this summer will be very diverse in the different departments that I am involved with, but they are all things that greatly excite me! Like they say “Experience is the teacher of all things.” Until next time, stay tuned!